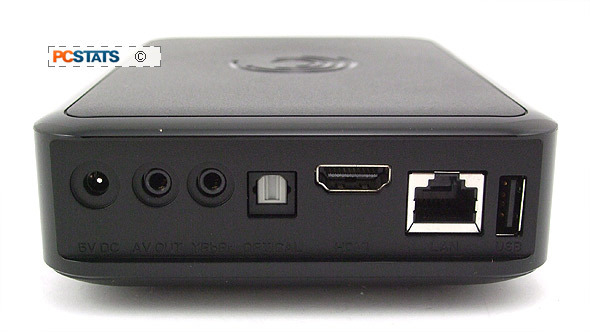 Seagate's GoFlex TV HD is a media player with network connectivity and hard drive dock. 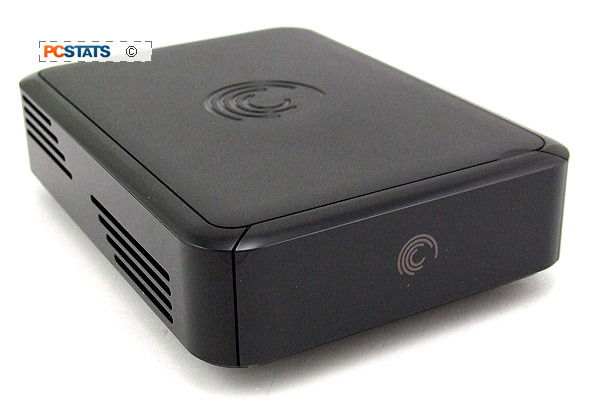 The pint-sized black box fits unobtrusively in a living room environment - unlike a full sized Media PC - and the GoFlex TV HD's on screen controls are simple to navigate via the infrared remote control. Full size media PCs often need a keyboard and mouse to be useful, having cooling fans that make a lot of noise and take up too much space; Seagate's GoFlex TV HD media player has none of the down sides. The GoFlex TV's on screen controls make it simple to play digital content (movie, music or photo) stored on a USB thumb drive, via Seagate's FreeAgent GoFlex ultra-portable hard drive when docked in the unit, or over a home network if you've enabled Media Sharing on a Windows 7 or 8 computer. Segate's GoFlex TV outputs video to televisions via HDMI, Component (RCA) or composite video (Y, Pb, Pr) so it's reasonably compatible with older television sets. In short. it's a little black box that does it all, but wait, there's more! The GoFlex TV HD can also bring in content from one of several internet-based sources like Netflix, Picassa and YouTube, either via the wired home network link or optionally over a wireless network via USB WiFi dongle. The only thing it cannot do is record. The Seagate GoFlex TV HD Media Player PCSTATS is testing in this review retails for just under $100USD, which is utterly fantastic IMHO. The 500GB GoFlex FreeAgent Ultra-Portable hard drive you'll see used in this review costs about $90USD. Other FreeAgent ultra-portable drives are available in capacities ranging from 320GB to 1.5TB, with interfaces options that include USB 2.0, USB 3.0, eSATA or Firewire 800. Both the media player and portable hard drive devices are Windows XP/Vista/7/8 and Mac OS X 10.4 compatible. ASF, AVI, DAT, DIVX, FLV, H.264, IFO, ISO, M2TS, M4V, MINUSVR, MKV, MOV, MP4, MPEG, MPEG-2, MPEG-4, MPG, MTS, RM, RMVB, TP, TRP, TS, VOB, WMV, XVID. MP3, AAC, AC3, APE, DTS, ASF, FLAC, WMA, LPCM, ADPCM, MKA, WAV, OGG. JPEG, BMP, GIF, TIFF, PNG. Includes: Infrared remote, AAA batteries, AC/DC power adaptor, component video cable, composite video/audio cable, instructions, software CD. 1) It quickly and easily provides access to digital content stored on a variety of sources, ie. HDD, USB, digital camera, network or internet. 2) It allows you to share media across a wired home network so it's possible to browse and manage the files from a networked computer with media sharing capabilities. In the past, one PC would typically store media which made remote browsing difficult unless the home network was properly configured. 3) It outputs digital content to a television through a selection of common video & audio interfaces without expensive graphics hardware or TV cards. 4) It's totally fanless and dead silent. Extremely compact too, barely larger than a pocket book. In short, Seagate's GoFlex TV HD ia a pretty cool bit of kit that bridges the gap between a home PC which increasingly stores all of a families digital content (movie, music, photo's) and the comfort of watching content in a living room on a big screen TV. Additionally, if you already own Seagate's portable GoFlex FreeAgent Ultra-Portable 2.5" hard drive, you can load that drive into the GoFlex TV HD's docking station and access all the digital content on the hard drive directly. A portable hard drive is a quick and simple means of transferring GB's of digital content from one PC to another. Along side Seagate's FreeAgent GoFlex TV HD Media Player, Seagate provide an infrared remote control (plus two AAA batteries), a DC power adaptor, a set of component (Y, Pb, Pr) & composite (VGA, L/R audio) cables and a CD with Seagate's Media Sync software. 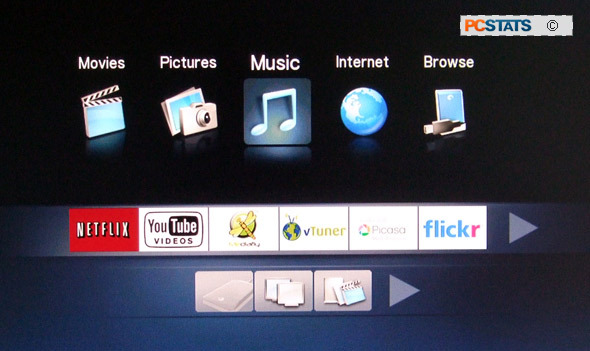 The FreeAgent GoFlex TV HD media player outputs video over HDMI, component video or composite video cables. The two latter cables are supplied. 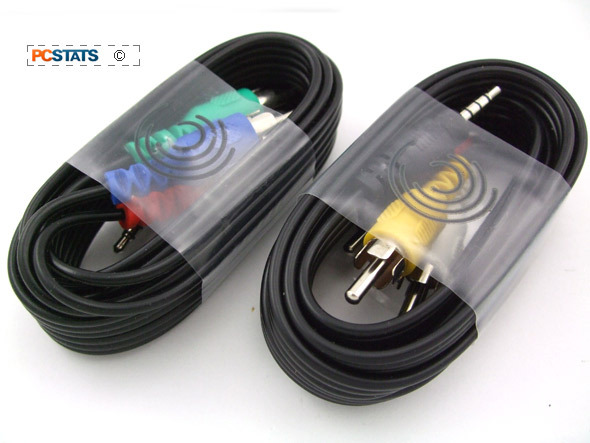 HDMI is the preferred choice for connecting to a HDTV as it carries high quality video and audio, however you'll have to provide the HDMI cable yourself. The infrared remote control for the Seagate GoFlexTV media player runs off two AAA batteries (included). The remote has simple up/down/left/right navigation and play controls. There is no Record button - that's one feature a media player does not support. If your home theatre set up includes a multi-channel amplifier, you'll be please to find an optical SP/DIF port on the back side of the GoFlex TV HD box for outputting high quality digital sound. Most users will connect the Seagate FreeAgent GoFlex TV HD Media Player via HDMi since this one cable takes care of 1080i video and high quality audio, so no great loss that the optical SP/DIF cable isn't included. As any home theatre enthusiast will tell you, the first place to look when considering a Media Player is the data ports. 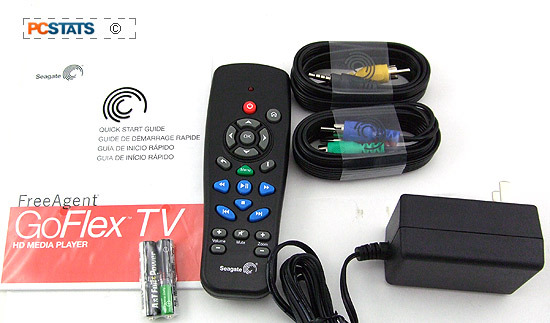 In this case the Seagate GoFlexTV HD is well equipped for modern and relatively recent HDTVs. If your ancient TV just has a coaxial cable input, you're out of luck. From left to right: DC Power, Composite Video and L/R Audio, Component video (Y, Pb, Pr), Optical SP/DIF, HDMI, RJ45 Ethernet LAN and USB 2.0. There is a second USB 2.0 port on the front right side of the GoFlex TV HD which is used to support a wireless USB dongle or USB thumbdrive. The reset button. The GoFlexTV HD only crashed once during PCSTATS tests, on account of a corrupted media file. The GoFlexTV HD reads USB thumb drives formatted in FAT, FAT32, NTFS and Mac HFS+. The USB 2.0 port on this side of the GoFlexTV HD is intended for an optional USB WiFi adaptor, which if installed gives the device wireless internet access via your home router. This port may also be used with a regular USB thumb drive, if you prefer to watch movies or other content off your removable storage media. Now for a look at the one feature that makes this media player entirely unique!